Old tyres can be completely recycled into lower emission diesel engine oil, instead of being dumped in dangerous, highly flammable stockpiles that become breeding grounds for malaria and dengue-carrying mosquitoes. 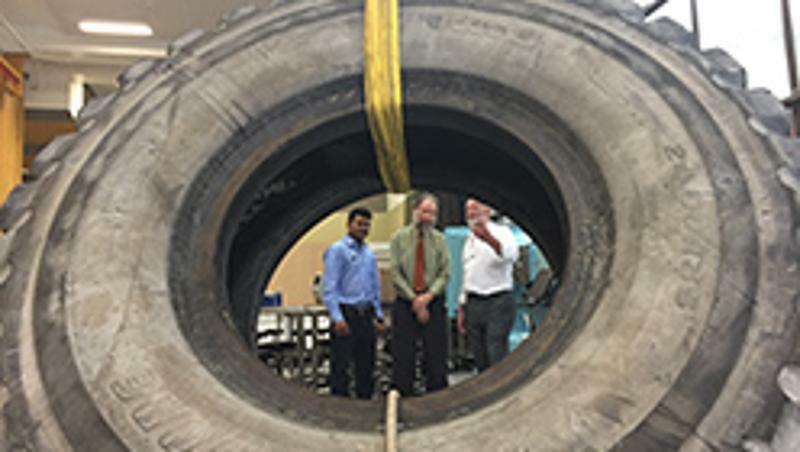 QUT mechanical engineers tested the oil extracted from old tyres in a process developed by Australian company Green Distillation Tecnologies (GDT). QUT’s Professor Richard Brown and PhD student Farhad Hossain tested the oil’s emissions and output at QUT's Biofuel Engine Research Facility. Professor Brown said that when the oil was blended with diesel it was found to produce a fuel with reduced emissions and no loss of engine performance. “Globally, 1.5 billion tonnes of tyres are discarded each year. Australia, alone, will generate 55 million disused tyres a year by 2020," Professor Brown said. “Getting rid of old tyres in an environment-friendly way is a universal nightmare. Mr Farhad said the QUT engineering team, including process engineer Dr Tom Rainey and air-quality expert Professor Zoran Ristovski, performed rigorous tests on the oil. “We tested the oil which GDT produces from both recycled natural and synthetic rubber tyres in 10 per cent and 20 per cent diesel blends,” Mr Farhad said. “We tested the tyre oil blends in a turbocharged, common rail, direct injection, six-cylinder engine in the Biofuel Engine Research Facility at QUT. “The engine is typical of engine types used in the transport industry. “Our experiments were performed with a constant speed and four different engine loads of 25, 50, 75 and 100 per cent of full load. GDT chief operating officer Trevor Bayley said the oil could also be used as a heating fuel or further refined into automotive or aviation jet fuel. “The process recycles end-of-life tyres into oil, carbon and steel, leaving nothing wasted and even uses some of the recovered oil as the heat source,” Mr Bayley said. “Carbon is the most common recovered ingredient and the steel rim and framework is the third most common ingredient, while the oil is the most valuable. “We are delighted at the findings of the QUT research as it will help us promote the sustainable use for end-of-life tyres. “The potential of this source of biofuel feedstock is immense, and it is more sustainable than other bio-oils from plants such as corn, or algae. “A recycled 10kg car tyre yields 4 litres of oil, 1.5kg of steel and 4 kg of carbon,, and a 70kg truck tyre provides 28 litres of oil, 11kg of steel and 28kg of carbon. About Green Distillation Technologies: GDT is an Australian company which has developed world-first technology to recycle end-of-life car and truck tyres into carbon, oil and steel. The company won a bronze medal in the world’s top innovation award, the Edison Awards, last year. Niki Widdowson, QUT Media, 07 3138 2999 or n.widdowson@qut.edu.au. Dennis Rutzou, GDT, 0411 510 888 or dennisr@drpr.com.au.